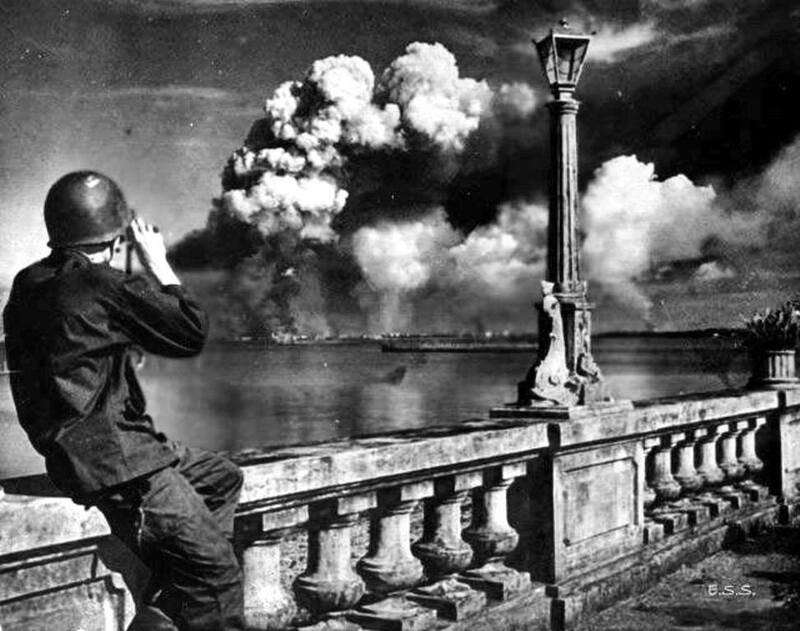 An American serviceman views the destruction during the Battle of Manila in 1945. 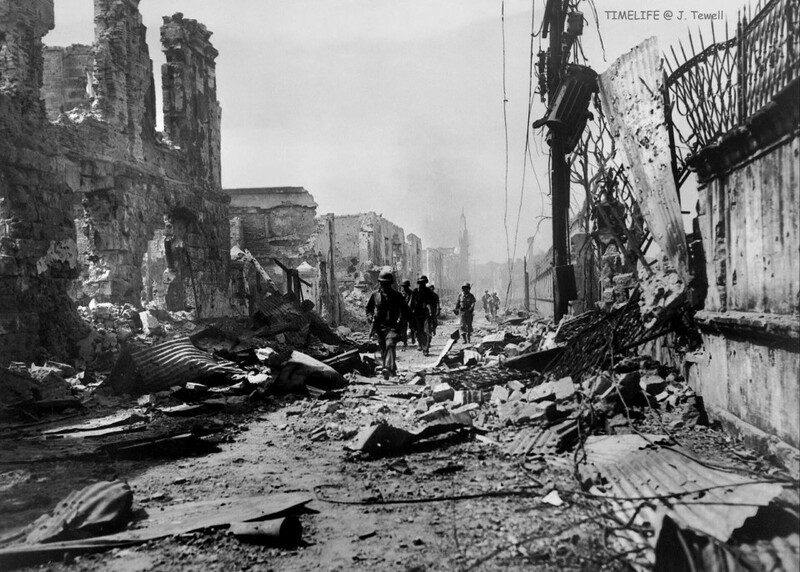 The Battle of Manila — one of the greatest tragedies of World War Two — finally ended on as the city was liberated on March 3, 1945. To give some context to the utter destruction of the city, by some estimates, the civilian death toll of 100,000 exceeded that of Hiroshima and Nagasaki combined. 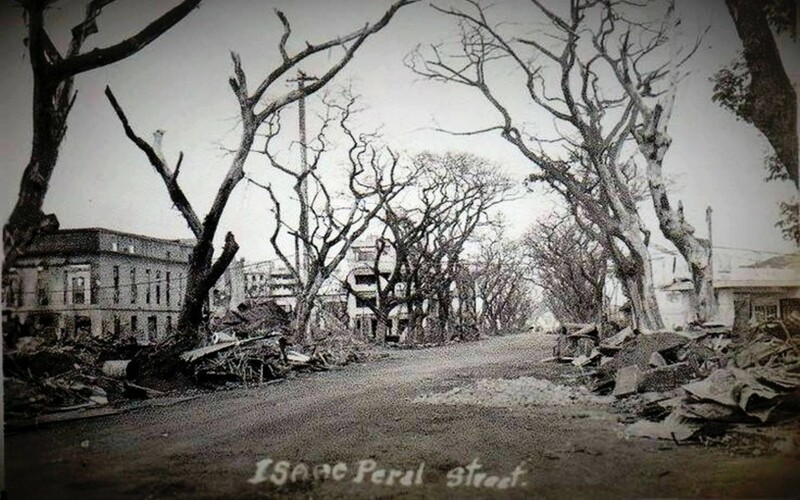 It also flattened the historic buildings and infrastructure that had earned Manila fame as ‘The Pearl of the Orient’. Only the most blindly patriotic could possibly use that term today. As American and Filipino forces prepared to head to Manila in January 1945, General Douglas MacArthur was hoping for a peaceful handover — he had, after all, in December, 1941, proclaimed Manila an ‘open city’ and withdrawn himself without a shot fired. American troops were given three major objectives — the University of Santo Tomas, where Allied civilians were interned, the Malacañan presidential palace and the Legislative Building, within which the Commonwealth would be restored. The American 1st Cavalry Division and the 37th Infantry Division first liberated the internees at the university and immediately moved on to the Malacañan Palace. This swift action spared parts of northern Manila from destruction, and was the beginning of what became known as the Battle of Manila. The Battle of Manila was waged for a full month. Recognising how his fortunes had turned, General Tomoyuki Yamashita withdrew to Baguio City where he hoped to hold back American and Filipino forces more effectively. A rump force left behind in Manila to hamper the Allied advance was commanded by Rear Admiral Iwabuchi Sanji. Steeped in the Japanese warrior code of Bushido, he ordered his soldiers to fight to the death. First they destroyed bridges to limit the mobility of the Allied forces. Then entire rows of houses and buildings in the areas of Escolta, Santa Cruz, Quiapo and Chinatown were torched. Inside were civilians, entire families locked in and burned along with their homes. The wind carried the flames and whole neighbourhoods were transformed into firebreaks. The ruination of the once beautiful city had begun. Realising they were surrounded and with surrender not an option, the Japanese holed up in heavy concrete buildings such as the Post Office, Congress, Manila City Hall, the University of the Philippines and other defensible structures within Intramuros. In a move to protect the city and its inhabitants, MacArthur had imposed restrictions on US air support and artillery. But some still perished through ‘friendly fire’ and the destruction of some areas was inevitable. 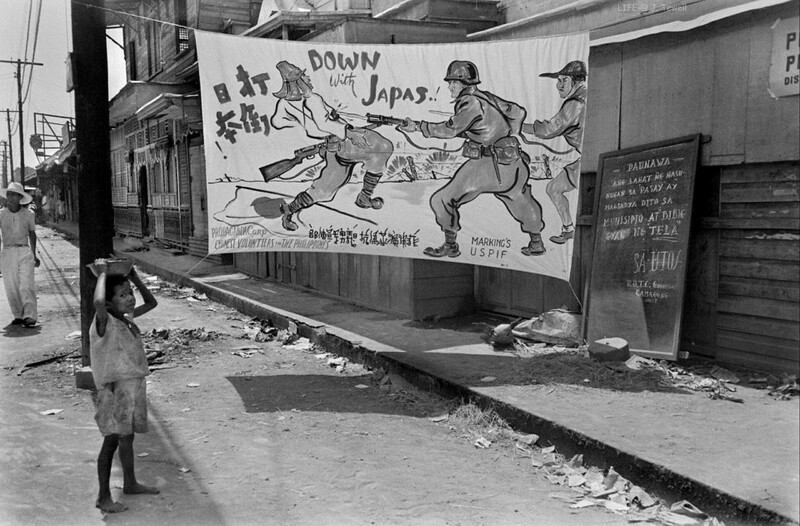 Anti-Japanese sentiment was strong as the battle raged. As defeat stared them in the face, the Japanese exacted a horrible vengeance on Filipino civilians and foreigners alike. Untold numbers were brutally massacred — by machine guns, bayonets and katanas. For women and girls it was even worse, with widespread rapes. Fort Santiago, San Agustin Church, De La Salle College, the German Club, San Juan de Dios Hospital and the Red Cross building were all left stained with blood. Brothels — or ‘comfort stations’ — were set up, most infamously the Bayview Hotel where enslaved Filipinas and expatriate women were forced to be ‘comfort women’. The Battle for Manila ended on March 3, 1945, 29 days after the arrival of the 1st Cavalry Division. In that time, 100,000 Filipinos perished and liberated Manila was no longer the Pearl of the Orient. Following the Japanese surrender in Baguio, General Yamashita was found guilty for the massacre of countless Filipinos and hanged. Survivors of the battle felt such hatred for the Japanese the destruction of their city was seen as a reasonable price to pay for being liberated. 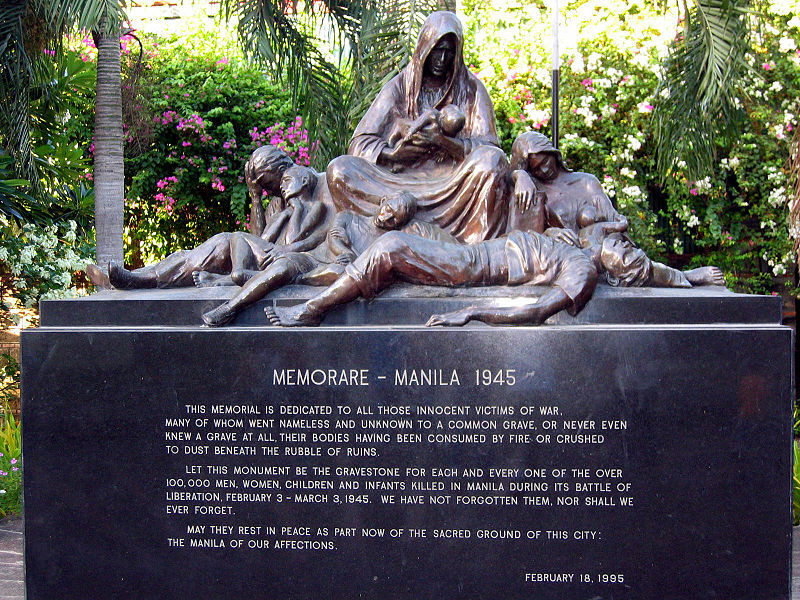 The tragedy is marked by the Memorare Manila memorial at the Plazuela de Santa Isabel in Intramuros. The Memorare Manila memorial at the Plazuela de Santa Isabel in Intramuros.